Storage is always an issue with us. We never seem to have enough. It's got a whole lot worse since having children. The picture above shows just their craft supplies - one of their favourite activities. I built the unit before Christmas and it's been great to have shelves to chuck things into and just kind of put away. It looks a blinking mess though and it's the first thing you see through the window as you pull up. 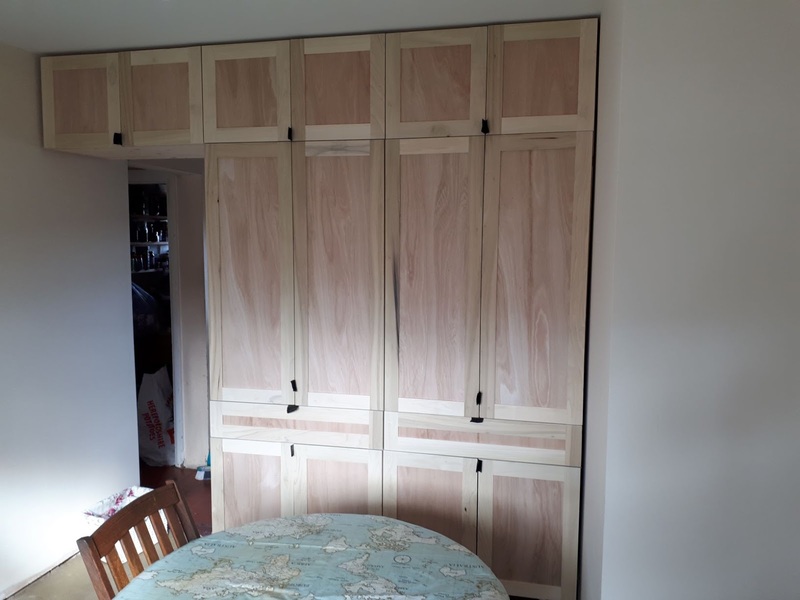 So last week I got cracking on making a few shaker doors for the unit. One of those jobs where I just need a chunk of time to work on them. Once I got started it didn't take long to make the 16 doors/drawer fronts. These are the same style as the kitchen ones I made. Today mum came over so we went through everything that was in there and sorted it out. So now it looks tidy on the outside and is also tidy on the inside as well. Until the kids get through it at least! Next job in there is to replace the table - I'm going to blog about that one step by step and it should be really nice when finished. These doors all now need to be painted when the kitchen ones are! Who else needs some storage like this? They look amazing, a job well done. You are very talented. Thank you! you're too kind! I'm a one trick pony really. If it doesn't involve wood or growing stuff I out! They do look amazing. A lot of new houses are like rabbit hutches with little or no storage space. You never have enough sheds too. How long did they take to make Kev? Yeah, I'm always keen to have storage to hide things away. When we designed the extension I dead excited that I could fit in a new storage cupboard to store the towels and stuff. The other one was in the daughters room and just so awkward with the water tank in there and stuff. Brilliant! It's so true that there's never enough storage space. I love shelves especially with doors! Not only do they look tidier, but they help keep the dust at bay (which is what one gets a lot of when one lives in an old house). They look so much better with the doors. The plan is the entrance to the utility will also be closed off but paneled to look the same as the rest of the doors. Not a secret door but it will be a bit more hidden and blend in. It'll make sense when I do it honest! This should help us keep clutter and dust out the way though hopefully. Need to make a big shoe draw next as well I guess to finish the room off. Just brilliant Kev, love it! thanks Sue! Should help us keep a bit more organised! Good gosh, what a totally fantastic transformation! Just makes the look and feel of the whole area so different . . . and attractive. You are such a craftsman with so much ability! Makes it look a bit different. Worst was that before they were the first thing you saw as you pulled up. I definitely need more storage. My kitchen is really large enough, they just didn't put cabinets all the way down the wall. My son is doing that for me this summer, then I'll repaint all the cabinets this summer. I'm excited about not having to go into the guest room closet for crock pot and groceries! I'm trying to keep stuff out the kitchen but the fact I can have a walk in pantry is going to make this possible. Can't wait to build it! that alone can be summed up as a life well lived. I love shaker style, I just don't like too many details on anything - more to dust for a start! The house feels so different to how it did a year ago it's unreal! Beautiful. I think they would look good left in a natural state. 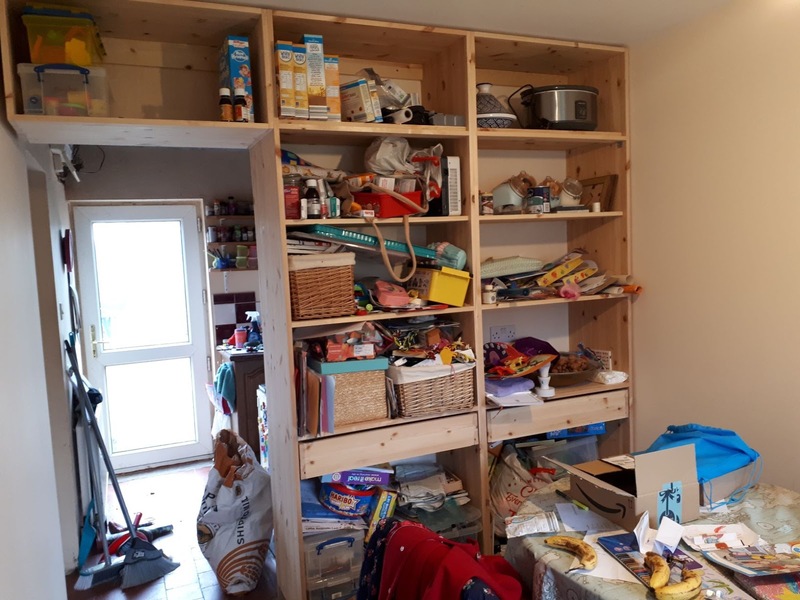 We have an open plan house which means less walls for storage cupboards. Very frustrating. The wood isn't the right type for leaving, it needs to be painted as a lot of the heartwood is green. Not saying it'll get painted anytime soon though!